Now you can instantly achieve that airbrushed look while not taking time out of your daily routine. With INFINI + LaseMD combination treatment we are able to treat all layers of the skin, all skin types at any time of the year. INFINI naturally stimulates collagen and elastin production that will tighten and improve wrinkling and acne scarring over time. LaseMD removes pigment, brightens skin and improves texture, giving visible results within days. What is INFINI micro-needling with Radio Frequency? The Lutronic INFINI is a microneedle RF treatment device, which means it uses a combination of radiofrequency energy and microneedling to provide dramatic skin tightening and skin rejuvenation. To achieve skin tightening, the deeper layer of skin, the dermis, needs to create new collagen. INFINI does this by using gold-coated insulated microneedles to create thermal coagulation zones. The customizable treatment is able to target the skin at different depths and energy levels. This enables a multi-layered approach resulting in long-term dermal remodeling and new collagen production without causing injury to the epidermis. What makes INFINI different than other RF devices? It’s fractional no bulk heating, the needles are insulated, needle depths are variable, coagulation occurs for maximal collagen stimulation, and the epidermis is safely protected from the heat. This allows for a very safe treatment for all skin types. INFINI is ideally suited for those with aging, sagging, wrinkled skin, and skin with pigmentation. INFINI is mostly used on the face and neck, but can also be used on the chest, abdomen, arms and other areas with great results. What is the LaseMD Skin Perfecting Laser? 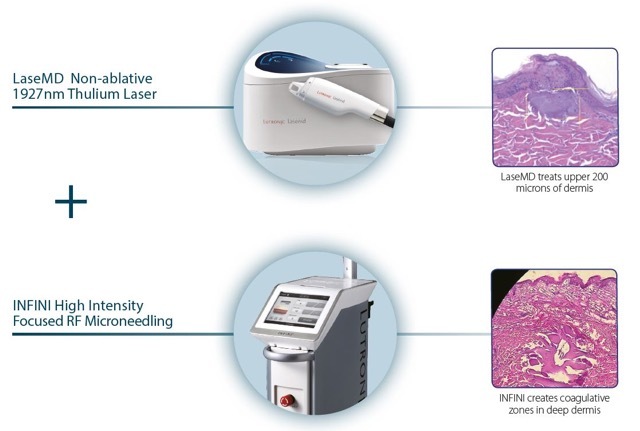 LaseMD Fractional Thulium laser treatment produces tiny but deep columns in the skin called microscopic treatment zones. What makes LaseMD stand out from other fractional lasers is the its dual skin rejuvenation approach. Besides resurfacing the skin to allow new skin to grow, LaseMD is a Cosmeceutical Delivery System (CDS). Typical cosmetic active ingredients have great difficulty penetrating the skin barrier. With the LaseMD, the serum penetration rate is greatly enhanced. Treatments can be customized to the patient’s skin concerns (brightening, melasma, photo damaged, anti-aging) by varying the types of serums used. LaseMD is fantastic for resurfacing the skin, eliminating pigment and sun damage, decreasing fine lines and wrinkles, diminishing pores, smoothing the skin and stimulating collagen. LaseMD is mostly used on the face, neck and chest, but can also treat larger areas exposed by the sun such as arms and legs. We are also able to treat actinic keratosis. INFINI and LaseMD are the best combination to keep your skin looking youthful. INFINI and LaseMD are typically done in the same treatment session to enhance results and actually promote a faster healing time. 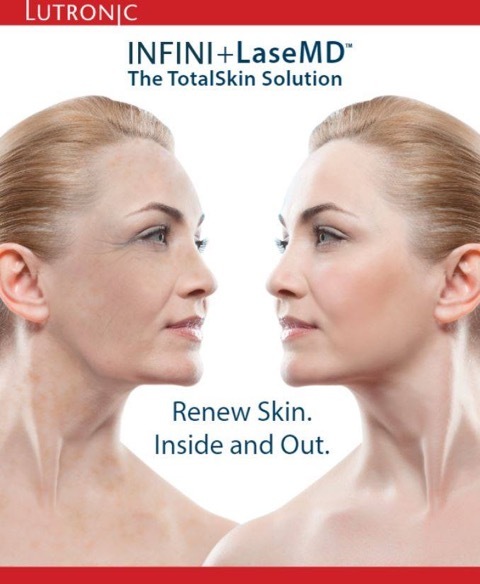 Both INFINI and LaseMD are a great stand-alone treatments and are offered separately. The results from these treatments will keep your skin looking beautiful, young and natural.